Verb started out of a salon and we know that if it wasn't for our biggest and hardest working fans, stylists, we wouldn't be where we are today. This is our "Stylists We Love" series where we highlight some of the amazing stylists that work with Verb and all their hard work. 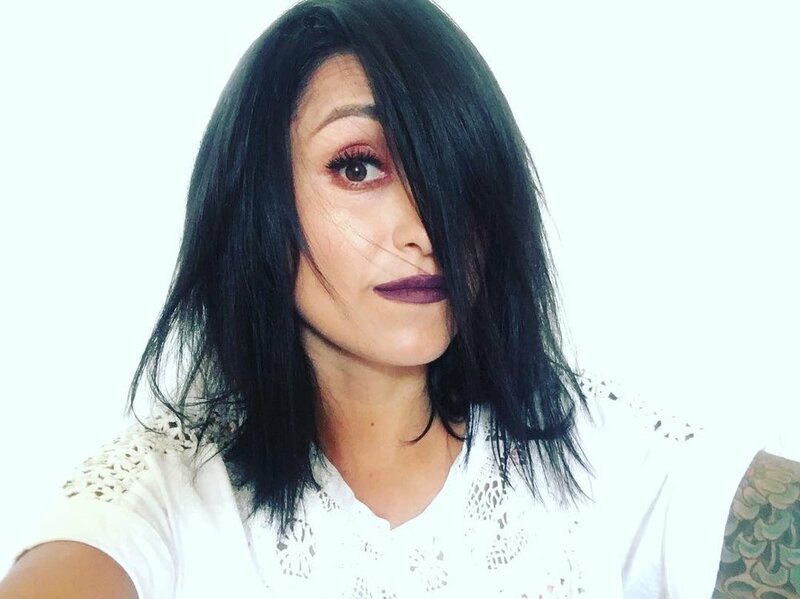 Interview with our hair & makeup artist Insta-crush turned Verb Educator, Nicci. We started crushing on hair & makeup artist, Nicci, when she began tagging Verb in her posts. All you have to do is check out her work above (@nicci_sanchez) and it's easy to see why. The relationship went from us liking (loving) her photos/work to eventually becoming a Verb educator! So we chatted with Nicci to ask her a few questions about her journey as a freelance stylist, and now as a part-time Verb educator. When she's not on location at a photoshoot, or teaching people about Verb she's being a badass full time mom of 3 (so impressive). Find out more about Nicci below. **Don't forget to tag us in your photos (@verbproducts) so we can fall in love with your work too! Where are you from? What do you do in your spare time? I was born and raised in Gilroy CA, which is the Garlic Capital of the world mind you! We actually have a garlic festival every summer, which has caused me to become a garlic snob haha. If you're looking for garlic flavored beer and ice cream then thats the place you need to be! Currently I live in Huntington Beach and since I am a freelancer I travel all over Southern California ... or where ever the job may take me. In my spare time you can find me laying low with my 3 mini me's by the pool or at the beach. What made you want to be a stylist? How did you get where you are? I'm not really sure what peaked my interest honestly, I mean ever since I could remember I have been fascinated with hair. So much so I gave my first hair cut when I was 5 at my friend Chelsey's slumber party, I probably owe her a do-over one of these days. If I wasn't cutting a friends hair I was cutting my barbies and coloring their hair with markers. After that I would always just style all my friends and their sisters hair growing up; I didn't really get into it as a full time job until I attended Paul Mitchell in 2010. For the first few years I worked behind the chair in the Bay Area and then when I made the move to Huntington Beach I worked at a salon for the first year and then decided I just wanted to do freelance Hair and Makeup on photoshoots and for personal clients. What's your favorite thing about being a stylist? When it comes to my personal clients one of my absolute favorite things about being a stylist is getting to know my clients and developing insanely amazing relationships. They aren't just clients but life long friends. My favorite thing when it comes to shoots is getting to work incredibly talented teams to create something rad. What's your personal philosophy when it comes to styling? Less is more. I really love to just amplify my clients natural look and really give them a style that will complement their overall look. What are some things you wish you knew starting out as a stylist? Any advice for someone who wants to become a stylist? Oh man, I wish I knew that anything I wanted to do in the industry was literally at my fingertips. I think I had it in my head I needed to work in a salon and that was as far as my license would take m. I would have definitely focused more on set work and assisting more when I first got out of beauty school had I known my options were really endless. I would tell someone to really look at all the industry has to offer and what direction they want to go in; take the right steps in that directions and focus on chasing that dream. What are some hair tips for your clients? Don't be afraid to make mistakes! Get in there and play with products and styles and figure out what really works for your routine and hair. Trust me, we all didn't get that french braid first time around. Just keep practicing! Well since most of the time I have some type of vivid hair color in my hair (it's been all kinds of colors) I typically only wash my hair once or twice a week. So I rely on Verb's Dry Shampoo and I spray Leave-in-mist throughout my ends followed my Sea Spray, then I usually put my hair in twists as I finish my morning routine. Once I am done with everything else I will take the twists out and then I will add a little Ghost oil and then spritz a little Ghost hairspray to tame any wild hairs for a beachy look. The most interesting person you've styled?